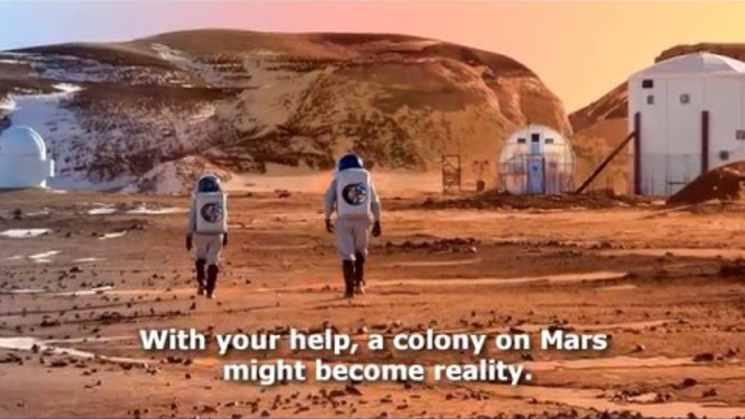 It happened in "The Martian"-- but can crops be grown on martian soil in the lab? The story of Mark Watney farming in Martian soil might be science fiction, but in real life scientists are emulating his actions. Researchers of Wageningen University & Research centre in the Netherlands are working on their second experiment where they grow crops on Mars and moon soil simulant. Building on information gathered from their first experiments, the team was able to grow ten different crop species including tomatoes, peas, rye, garden rocket, radish, and garden cress. The goal of the research is to provide the basis for growing crops on Mars and the moon, in order to feed the first settlers. So what exactly is a soil simulant? NASA makes them out of our very own terra firma, and you can buy your own here. The Mars simulant comes from a volcanic cone in Hawaii, and has a chemical composition similar to the Mars dirt that the Viking 1 lander analyzed. The Moon simulant comes from volcanic ash deposits near Flagstaff, Arizona. During the experiment Earth potting compost was used as a control. Plants were cultivated in a glass house under constant temperature, humidity and light conditions and under Earth atmosphere. “This is because we expect that first crop growth on Mars and moon will take place in underground rooms to protect the plants from the hostile environment including cosmic radiation”, states researcher Dr. Wieger Wamelink. The results showed improvement, especially the crop growth on the moon soil simulant. Where in the first moon soil experiment most plants died, in the next round they flourished, and the researchers could harvest from the same species as on the Mars soil simulant and the Earth potting compost control. So did the scientists end up having a feast? Opening their own niche farmer’s market? Not quite. “The soils contain heavy metals like lead, arsenic and mercury and also a lot of iron. If the components become available for the plants, they may be taken up and find their way into the fruits, making them poisonous. “Further research on this is necessary and that is one of the reasons why a crowdfunding campaign has been started to finance the third experiment that will be all about food safety. The experiment should start in April 2016 with the growth of a new batch of crops including potatoes and beans. If the crops prove to be safe enough to eat, the funders will be invited for dinner where a ‘Martian meal’ will be served that includes the harvested crops; at least for those who dare!,” says Wamelink. If you’re feeling brave, you can check out the campaign here and become one of the first to have a Martian dinner.